Early adopter in-stock alert! The Sony RX10 III is now in-stock and ready to ship for its starting price of $1600 with free expedited shipping from B&H Photo. This as we just updated the Stocks Status Tracking page, now covering the Fuji X-T2, Canon 5D Mark IV and Canon G7 X II, along with the aforementioned. This is the first in-stock alert for this set of tracked cameras. If you are interested in getting the new condition Sony RX100 I or II from an authorized dealer at the current authorized dealer prices of $500 and $650 respectively, for a limited time, B&H Photo is also including a $50 B&H Photo Gift Card until 7/24/16 as one of their Photoshop World Specials. If of the many compacts with RAW it is the Sony RX10 II the one you want, it is on sale in new condition for $998 thanks to a $200 instant savings promotion at Abt Electronics. The shipping estimate is 7-14 business days. They are authorized online dealers. The Canon G9 X compact with RAW goes for $400 at authorized Canon dealers, but they are allowed to add free accessories with purchase. If you are an accessories hoarder or if you would like to try the Corel digital imaging software AND you also want the Canon G9 X, all three bundled together in a big bundle at Adorama for $399 PLUS shipping (around $11 from East to West Coast, enter zipcode to get accurate estimate). It is available in either the brown G9X or the black G9X. The extra shipping fee translates to the Corel software bundle that includes AfterShot PRO 2 and Paintshop X8 PRO (and a few other non-imaging titles), along with a 58-inch Takama tripod with 3-way head, a Lowepro pouch, a 32GB Lexar card, and the obligatory cleaning kit. For the boldly going early adopters, the third generation of the Sony RX10 1-inch superzoom (with its 24-600mm eq) is now in-stock and ready to ship to your front door (or other address of choice) for its starting price of $1500 with free shipping at B&H Photo. Temptation time if you are already being tempted by the Panasonic LX100 rawsumer. The brown color scheme of the camera is bundled with a $200 Adorama Gift Certificate, together going for $700 with free shipping at Adorama. For more action, check the Adorama Mother’s Day Special Offers. If you don’t need the official case, or you prefer a boatload of free accessories, Adorama is bundling it with Corel software bundle (includes AfterShot PRO 2 and Paintshop PRO X8) along with a ProOptics 49mm Essentials Filter kit, a Lowepro pouch, a 16GB Toshiba SD card, and the obligatory cleaning kit. PS: for the speed readers out there, this is the older Fuji X10 fixed lens camera, not to be confused with the newer Fuji X-T10 interchangeable lens camera. The Sony RX10 II (second generation) is bundled with a $100 B&H Photo Gift Card, together going for $1200 with free shipping at B&H Photo. Alternately you can select bundles with Free Accessories or a Free Sony ECM-XYST1M Mic instead of the $100 gift card. Keep in mind the last model is the 3rd generation RX10 with a May 2016 release estimate and a starting price of $1500. The Canon Pixma mail-in rebates are also good for some of the Canon RAWsumers. The Canon G9 X goes for $400 on its own at authorized dealers, but if you also want the Pixma PRO 100 printer and don’t object to mail-in rebates (prepaid American Express gift card), you can get it for $350 after a $350 mail-in rebate at Adorama. This includes the standard Canon G9 X kit, the Pixma PRO 100 printer, its trusty SG-201 sidekick (50pk 13×19″ paper) and camera bag and 32GB Sandisk card. The Fuji X100T BSP (Big Sensor Prime) goes for $1300 at authorized dealers who are allowed to offer some bonus items with it (eg free Rode Mic at Adorama or 4% rewards and 32GB SDHC at B&H Photo). 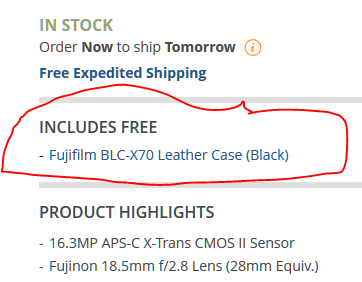 But if you are more of a risk taker and imported grey-market items do not give you nightmares on Warranty Street, then among the latest eBay Deals we find a new condition imported grey-market Fuji X100T with a 1-year seller warranty (not Fuji USA warranty) going for $800 with free shipping in either black or silver. The seller is Electronics Valley (99.5%) and it ships from New Jersey. As usual with these type of situations, it is up to you to decide what’s right for you and how much risk and adventure you are willing to invite. We blog, you decide! Speaking of eBay, they have a semi-curated refurbished camera gear sale with 60+ items included. The Canon G9 X dropped to $400 at authorized dealers. Adorama is offering it at this price but also adding a handful of free accessories with it, a 58″ Takama tripod, a 32GB Sandisk microSD with adapter, a Lowepro pouch, a cleaning kit and the Corel software bundle (includes Aftershot PRO 2 and Paintshop PRO X8 among others). This is available for both the brown G9X and the black G9X. The official Canon USA store has a refurbished Powershot sale that includes the SX400 IS for $80 in black or red, and the refurbished SX600 HS in red only for $90. They come with a 1-year Canon warranty. The G X series is on page #2 of that page, the refurbished G7 X for $480, the refurbished G1 X II for $550, and the refurbished G1 X for $270. On a more serious note, in addition to the previously mentioned Black Friday countdown clock, the Canon USA store has a sale on 19 refurbished Canon Powershot digital cameras. This goes from a $30 A-series to a $550 G series (G1X II). All the ones at the aforelinked page are refurbished with a 1-year Canon warranty. About half of them are currently out of stock, but in-stock is the SX520 HS superzoom for $90, the SX510 HS with a case for $100, the N square thang for $90, the SX700 HS for $140, the G16 rawsumer for $280, the G7 X for $480, and the aforementioned G1X II rawsumer for $550 (with free extra battery and 4GB SD card). All these are refurbished with a 1-year Canon warranty. It is nice to see Canon taking the compacts with RAW seriously again. And they have yet another new model, it is the second generation of the Canon G7-X, the “G7 X Mark II” with a 20mp 1″ CMOS sensor and 24-100mm eq f1.8-2.8 lens and a starting price of $700 at Adorama and B&H Photo. This has been added to the Cameras & Lenses of 2016 tracking page. The Canon DSLRs are not the only Canon cameras eligible for the Pixma AMEX Mail-In Rebate offers. Some of the more serious Powershots with RAW are also eligible. B&H Photo has one such bundle centered on the Canon G16. You pay $730, submit a mail-in rebate, and receive a $350 American Express Gift Card a few weeks later, making this a $380 after $350 MIR offer. For that, you receive the Canon G16, the Canon Pixma PRO 100 printer, a 50pk 13×19″ Canon photo paper, and a 32GB Transcend SD card (and the $350 AMEX Gift Card via mail-in rebate). The Canon G3X goes for $900 at authorized dealers, but if you also want the optional EVF-DC1 EVF (goes for $220 on its own), you can get both the G3 X and the EVF-DC1 together for $918 with free shipping at Adorama. Simply add to cart and proceed… Thanks to one of our readers for the email alert! The good old black Panasonic LX7 compact with RAW (1/1.x” sensor) is now on sale for $248 with free expedited shipping at B&H Photo. This has been around for a while, so you should be able to find plenty of reviews and samples and comparisons and such. The last time we mentioned the Hasselblad Stellar in early December 2015, it was going for $800. Upon a recheck today, we have further price drops, you can get it for $650 in various Special Edition color schemes at B&H Photo. At that page you will also find the 16mm f2.8 E-mount lens continuing to sell for $150 (or $200 with a lens case). There are many compacts with RAW these days with sensors larger than 1/1.7″, but if of all the RAWsumers it is the new condition black Panasonic LX7 the one you want, it is on sale for $248 with free shipping at B&H Photo. Free next day delivery for a limited time only. Free shipping on-going. To the mail-in rebator go the spoils. The Canon G16 compact with RAW (1/1.7″ sensor) is bundled with the Canon Pixma Pro 100 printer and 50pk 13×19″ Canon paper and 32GB Sandisk Ultra SHDC card for $220 after a $350 mail-in rebate (prepaid American Express Gift Card) at B&H Photo. The Canon G5 X 1-inch sensor compact with RAW is bundled with a $100 B&H Photo Gift Card, and all together are on sale for $750 with free shipping at B&H Photo. $750 is the price at authorized dealers. The black Canon G9 X is currently on sale for $450 and it earns 10% promotional rewards (= $45~) at B&H Photo and Adorama. RAWsumers get their Pixma-MIR bundles as well. For example, you can get the Canon S120 compact with RAW, along with the Pixma PRO 100 printer and 50pk 13×19″ SG-201 photo paper and 32GB Lexar SD and Lowepro shoulder bag for $250 after a $350 mail-in rebate (prepaid AMEX Gift Card) at Adorama. UPDATE: The same offer, but without the 32GB SD and camera case is available at B&H Photo. The Canon-Pixma-MIR bundles are not just available for the Canon DSLRs. Some of the more advanced Powershots are also eligible. For example, the Canon G7X standard kit goes for $600 at various authorized Canon dealers at the moment. But if you want a printer as well and do not object to mail-in rebates and prepaid AMEX gift cards, you can get the Canon G7 X with the Pixma Pro 100 printer and 50pk 13×19″ photo paper and 32GB SDHC and camera bag for $500 after a $350 mail-in rebate (prepaid AMEX gift card) at Adorama. The latest B&H Photo Deal of Days promotion is a Hasselblad and Zeiss Touit sale featuring many of Hasselblads re-incarnations of Sony cameras. This includes E-mount cameras and lenses, along with an A-mount SLR, and RX-series cameras. Also joining in the sale party are three Zeiss Touit E-mount lenses, the 12/2.8 for $700, the 32/1.8 for $500, and the 50/2.8M for $1000. Also participating is the Hasselblad 16mm f2.8 (E-mount) for $150. Meanwhile, the theme of the latest B&H Days of Deals group sale is a Smartphone Sale featuring various phones and accessories, including the Panasonic CM1 Android-Camera with 1″ sensor for $450, the Nexus 5X bundled with a $20 B&H Gift Card Card for $330 (16GB) or $380 (32GB), along with models from Samsung (eg 32GB Galaxy S6 for $480), ASUS, LG, Sony, Blu, ZTE, Alcatel and Huawei. The sale also includes accessories such as olloClip add-on lens bundles and cameraphone-holders. The Panasonic FZ300 superzoom (a RAWzoomer with a 1/2.3″ sensor and 40x optical zoom) is now down to $550 with free shipping at authorized Panasonic dealers such as B&H Photo and Adorama and Amazon itself. We have a quarter of Canon-Pixma mail-in rebate promotions. We start with the Canon G16 compact with RAW, bundled with the Pixma Pro 100 printer and 50pk 13×19″ photo paper and Lowepro case for $250 after a $350 mail-in rebate at Adorama. The Canon G3X goes for $900 at authorized Canon USA dealers, but if you are also fond of detachable EVFs, you can get the G3X bundled with the Canon EVF-DC1 Electronic Viewfinder for $918 with free shipping at Adorama. If you are comfortable with mail-in rebates and prepaid American Express Gift Cards, B&H Photo has a Canon G16 Pixma AMEX MIR bundle for $270 after a $350 mail-in rebate (prepaid American Express gift card). You get the Canon G16 standard kit and the Pixma Pro 100 printer and a 50pk 13×19 inch photo paper. Time sure does fly, we now have four different generations in the Sony RX100 line. The original model is now bundled with a $50 Adorama gift certificate and a screen protector and $9 in promotional rewards for its standard price of $450 at Adorama. Perhaps in some ways the spiritual successor to the good old Olympus E-10 line, the first generation of the Sony RX10 is currently bundled with a $100 Adorama gift certificate and an extra Sony battery and $18 promotional rewards for its standard price of $900 at Adorama. If you like the Sony RX100 cameras dressed in Hasselblad designer clothing, the Hasselblad Stellar Special edition is on sale for $800 with free shipping in seven different color schemes at B&H Photo. The Fuji X30 compact with RAW was going for $500 last week when we posted the RAWsumer price chart but you can now get it for $400 with free shipping and 4% promotional rewards in either color scheme at B&H Photo and Adorama and Amazon (no rewards but you get a semi-free Shutterfly 8×8 photo book [the book is free but you have to pay shipping]). PS: our customary “Black Friday / Holiday Season Camera Deals Situation Room” at the Main Blog should go live in the next few hours. I am waiting for the early Friday wave to start, it would make that a good starting point. Adorama has another rebate bundle centered around the Canon G9 X rawsumer. It also includes the Pixma Pro 100 printer, 50pk 13×19 inch photo paper, gadget bag, and 32GB Lexar SD. It goes for $400 after a $350 mail-in rebate (prepaid AMEX gift card). Offer ends 11/29/15.